The media comany I work for presents their IOS apps on local fairs from time to time. I had reports from the ladies presenting the apps on iPads, that they were not charging or even discharging despite being plugged in. Having nothing better to do on a Friday afternoon, I drove to the fair, equipped with a few spare iPads and power supplies, to see for myself what was going on. Although Apple has it on their web site, I was not aware of the fact that there are three different power supplies out there. All looking the same. The power ratings (top-to-bottom) are 12W, 10W and 5W. Watts: Better to look at them, than to look for them. 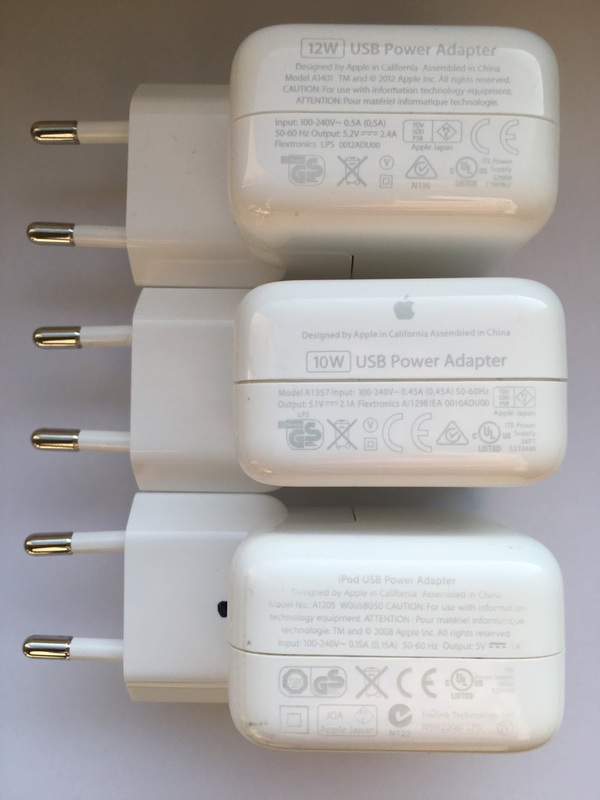 The 5W adapter apparently came with an iPad mini, while the 10W adapters are for all iPads without retina display. With a 10W adapter, an iPad with retina just seems to be able to hold it's charge at reduced screen brightness. A 5W adapter is just useless to keep an iPad retina on constantly. I replaced all chargers with 12W models. All iPads charged up ok, leaving some happy people to work through the weekend on the fair.